I just LOVE farm parody videos. I love how fun and entertaining they are to watch and how they show a glimpse into farm life for so many people who may have never been exposed to a farm otherwise. It's the week before Christmas, so just in case you're procrastinating and looking for distractions, let me help you. Here are a few of my favorite farm parody videos. I hope you enjoy them as much as I do! 'Little Fred'...Granny says this adorable kid reminds her of my brother when he was that age. 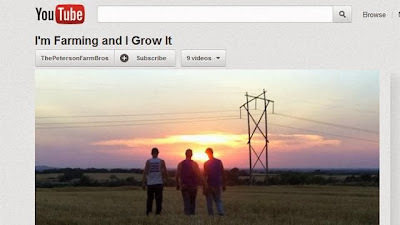 The Peterson brothers from Kansas are fantastic advocates for agriculture and are so clever with the videos they come up with.